The Global Village is a shopping, eating, and entertainment extravaganza that runs throughout the winter months in Dubai. Bringing together traditions from across the globe, thousands flock each year to sample the exotic foods and international goods. Visitors experience the sights, sounds, and smells of hundreds of diverse cultures. They are many countries represented, with each housed in its own enormous pavilion decorated in accordance with the country's heritage. 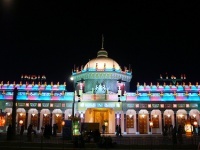 Organisers strive to make the annual attractions and pavilions at the Global Village bigger and better. In recent years, attractions have included a five hundred metre manmade canal and a forty metre Ferris wheel overlooking the desert.